• Signal acknowledgement (handshaking) capability reduces network congestion and increases signal integrity. • Pre-programmed signal routing ensures that signals take the fastest most efficient route to the base station (iprs2). 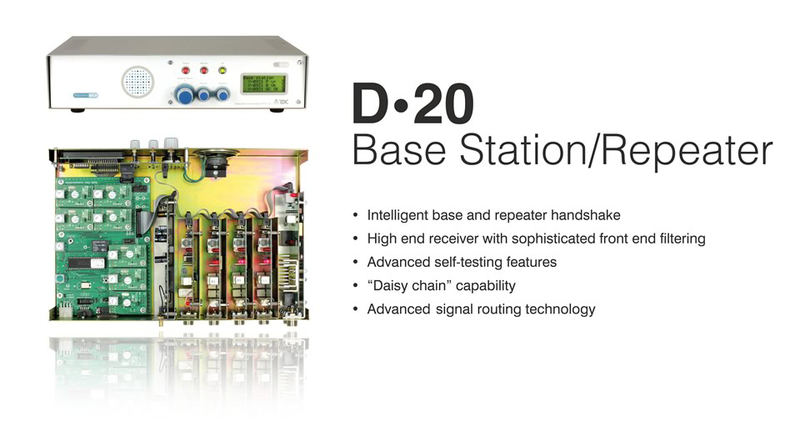 • "Daisy chain" capability allows signals to be sent out of difficult terrain and over extended distances. • High end receiver with sophisticated front end filtering for interference immunity - particularly important for interference prone repeater high sites. No additional cavity filters are required. • Each unit is able to accommodate up to 4 receivers, each on their own frequency. • May be used either as a base station or as a repeater to extend the range of transmitters on the network. • One unit provides backup for a base station or repeater. • Advanced features, yet reasonably priced. • Machine assembled to highest quality standards. • Compatible with all RDC transmitter models. • Used with an external 2A charger and high capacity battery for load shedding conditions. • Up to 30 repeaters per network for increased coverage and performance. • Multi-user facility of up to 400 users. • Pre-programmed mains-fail and self-test reporting allows for pro-active network monitoring. • Remote route programming and editing via FTP. • RS-232 serial output compatible with all control room monitoring software.